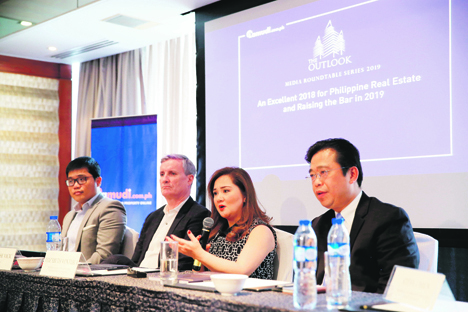 Manila, Philippines—Lamudi’s recent Outlook media roundtable series offered a glimpse of the trends that defined Philippine real estate in the past year, and what the future might hold for the sector. The event, moderated by Lamudi’s chief executive officer, Bhavna Suresh, highlighted issues such as the role that internet plays in the real estate sector to what’s in store for the commercial and residential property developers targeting the POGO (Philippine Offshore Gaming Operator) market. The roundtable’s panelists were Mr. Christophe Vicic, country head of JLL Philippines; Mr. Janlo De Los Reyes, JLL Philippines’ head of research and consulting; Mr. Steve Chien, regional controlling principal of Keller Williams; and Ms. Elizabeth Ventura, president, and executive director of Anchor Land Holdings, Inc.
As the internet continues to evolve, members of the panel opined that trends in digital marketing will continue to help them communicate their products and services to their clients. Anchor Land’s Ventura noted that not only are they able to educate their clients better about their property offerings, but the projects that the company ventures into have become more viable because of the information that they get about their prospective clients and the feedback that they receive from them. “When you’re very clear with the needs of the clients, you can properly plan your projects,” Ms. Ventura said. She added that online real estate property platforms such as Lamudi will continue to play a more critical role in strengthening the relationship between property developers like Anchor Land Holdings and property seekers who use the online platform in their search of properties to buy and invest it. “We need more info about the clients so we could advance and improve our offerings,” she explained. Keller Williams’ Chien likewise credited the property portal for playing a pivotal role in the real estate industry and in helping generate interest among individuals who wanted to become potential real estate agents. “It’s a movement,” Chien said, adding that Keller Williams, which is one of the largest property broker in the United States, even had to accommodate more than a thousand individuals in one of their training workshops for prospective real estate agents. Because of advances in communication and in internet technology, “we’ve seen more people participate in the real estate industry,” he said..
“We want to harness the technology so we can do a better job,” said JLL Philippines technology head De Los Reyes. JLL country head Vicic added that technology has impacted everyone in the property development sector. “We want to change its focus on how it conducts business in the real estate sector by transforming itself into a technology company that operates in the property development market,” he averred. Asked whether the real estate industry is lagging in terms of keeping up with the demands outside of the metro and trends like condormitels, Vicic said that urbanization is the one calling the shots. De Los Reyes shared this sentiment, adding that the demand has always been there, maybe just not as emphasized as what you see. As in the case of “condormitels”, he noted that areas near popular university campuses like Katipunan, UP, and U-belt, have long offered this type of accommodation to students. And as a response to the evolution of the working population, they are now in the fringes of central business districts like BGC, Ortigas, and Makati. “There’s a lot of moving parts to it. There’s urbanization. There’s technology. All of these play a role in terms of shaping the readiness of the market,” he pointed out. Chien agreed, noting that the main reason why rents are going up fast in Bay City can be traced to the growing demand for residential abodes of POGO workers, which property developers need to keep pace with. But he also pointed out that gaming operators aren’t synonymous to the entirety of the anticipated Chinese investment that will enter the country. Vicic said property developers who want to venture into the growing POGO market should learn to invest in the POGO workers. “We do a reference check on Chinese POGO workers (when we talk to building operators).” He also recommended that landlords should keep a balanced mix of tenants in their properties. “If I were a landlord I would not rely on POGO for a long-term strategy only because it’s highly visible and politically-charged because of the nature of the industry,” he said.